The Hudson Controversy was misunderstanding between Henry Irving and another actor named Charles Hudson. A number of different interviews with Bram Stoker, concerning this controversy, were published on November 1, 1886. 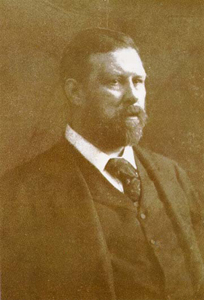 “A Chat with Mr. Stoker About Irving” was an interview with Bram Stoker by an unnamed reporter. It was first published in the US in the November 1, 1886 issue of the New-York Daily Tribune, New York. It first appeared in book form on December 24, 2012 in The Forgotten Writings of Bram Stoker edited by John Edgar Browning. It was so late in the evening when I arrived at Scarp that I had but little opportunity of observing the external appearance of the house; but, as far as I could judge in the dim twilight, it was a very stately edifice of seemingly great age, built of white stone. When I passed the porch, however, I could observe its internal beauties much more closely, for a large wood fire burned in the hall and all the rooms and passages were lighted. The hall was almost baronial in its size, and opened on to a staircase of dark oak so wide and so generous in its slope that a carriage might almost have been driven up it. The rooms were large and lofty, with their walls, like those of the staircase, panelled with oak black from age. This sombre material would have made the house intensely gloomy but for the enormous width and height of both rooms and passages. As it was, the effect was a homely combination of size and warmth. The windows were set in deep embrasures, and, on the ground story, reached from quite level with the floor to almost the ceiling. The fireplaces were quite in the old style, large and surrounded with massive oak carvings, representing on each some scene from Biblical history, and at the side of each fireplace rose a pair of massive carved iron fire-dogs. It was altogether just such a house as would have delighted the heart of Washington Irving or Nathaniel Hawthorne. The house had been lately restored; but in effecting the restoration comfort had not been forgotten, and any modern improvement which tended to increase the homelike appearance of the rooms had been added. The old diamond-paned casements, which had remained probably from the Elizabethan age, had given place to more useful plate glass; and, in like manner, many other changes had taken place. But so judiciously had every change been effected that nothing of the new clashed with the old, but the harmony of all the parts seemed complete. I thought it no wonder that Mrs. Trevor had fallen in love with Scarp the first time she had seen it. Mrs. Trevor’s liking the place was tantamount to her husband’s buying it, for he was so wealthy that he could get almost anything money could purchase. He was himself a man of good taste, but still he felt his inferiority to his wife in this respect so much that he never dreamt of differing in opinion from her on any matter of choice or judgment. Mrs. Trevor had, without exception, the best taste of any one whom I ever knew, and, strange to say, her taste was not confined to any branch of art. She did not write, or paint, or sing; but still her judgment in writing, painting, or music, was unquestioned by her friends. It seemed as if nature had denied to her the power of execution in any separate branch of art, in order to make her perfect in her appreciation of what was beautiful and true in all. She was perfect in the art of harmonising-the art of every-day life. Her husband used to say, with a far-fetched joke, that her star must have been in the House of Libra, because everything which she said and did showed such a nicety of balance. Mr. and Mrs. Trevor were the most model couple I ever knew-they really seemed not twain, but one. They appeared to have adopted something of the French idea of man and wife-that they should not be the less like friends because they were linked together by indissoluble bonds-that they should share their pleasures as well as their sorrows. The former outbalanced the latter, for both husband and wife were of that happy temperament which can take pleasure from everything, and find consolation even in the chastening rod of affliction. Still, through their web of peaceful happiness ran a thread of care. One that cropped up in strange places, and disappeared again, but which left a quiet tone over the whole fabric-they had no child. There was something simple and holy in their patient endurance of their lonely life-for lonely a house must ever be without children to those who love truly. Theirs was not the eager, disappointed longing of those whose union had proved fruitless. It was the simple, patient, hopeless resignation of those who find that a common sorrow draws them more closely together than many common joys. I myself could note the warmth of their hearts and their strong philoprogenitive feeling in their manner towards me. From the time when I lay sick in college when Mrs. Trevor appeared to my fever-dimmed eyes like an angel of mercy, I felt myself growing in their hearts. Who can imagine my gratitude to the lady who, merely because she heard of my sickness and desolation from a college friend, came and nursed me night and day till the fever left me. When I was sufficiently strong to be moved she had me brought away to the country, where good air, care, and attention soon made me stronger than ever. From that time I became a constant visitor at the Trevors’ house; and as month after month rolled by I felt that I was growing in their affections. For four summers I spent my long vacation in their house, and each year I could feel Mr. Trevor’s shake of the hand grow heartier, and his wife’s kiss on my forehead-for so she always saluted me-grow more tender and motherly.